From the moment the plane landed in Havana, Cuba, it didn’t take me long to realize that I wasn’t in the United States anymore. The majority of the people on the plane were Cuban-Americans, and they celebrated the landing with a round of applause. Outside of the airport were the families of the Cubans on board. I met a Cuban-American at the Miami airport who was going back to Cuba for the first time in twenty years. He told me that he was looking forward to being reunited with his son, who he hadn’t seen since he left. Now reflecting on the moment, it’s very thought provoking. Here were these people that, for whatever reason, wanted to be back in Cuba, but throughout the remainder of the trip most of the people I met had stories of attempting to come to U.S. or aspirations to do so. I made it through the crowd at the airport along with 10 other students, a professor, and a former NBC correspondent, to our tour guide and tour bus. We began driving through Havana, and the guide was describing everything around us. I had a hard time paying attention to what she was saying because I was so immersed in the culture of classic 50’s cars and architecture, and the vibrant colors of Cuba outside my window. The Malecón in Havana, Cuba, built by the United States government. I do remember her speaking about “The Malecón,” the word always rings a bell in mind, and takes me back to that first day in Cuba. 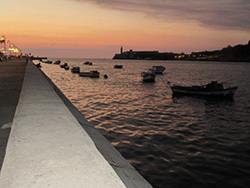 The Malecón is a picturesque five-mile road and pathway along the sea in downtown Havana where locals and tourists come to stroll, and fisherman to catch their dinner. Before I even went to Cuba, I knew that there was an embargo (or blockade) and that things would be different from home, but nothing could have prepared me for what happened as I was touring Havana. In the U.S. there are the well-known brands such as McDonald’s, Pepsi, Starbucks, and my favorite Rockstar, and I knew that I wouldn’t have these amenities while I was there. What I hadn’t considered beforehand was that the Cuban people would take interest in what I brought from the U.S. And on that first day, while I was walking in the 100° heat through the city of Old Havana, a man came up to me and started pointing at and asking for my Cougar hat. As I took my hat off to confirm that’s what he was talking about, he started to point at the New Era logo on the side. New Era is the official brand of Major League Baseball and is known globally, but it’s not sold in Cuba. He kept pointing at the logo and saying to me, “Here, we can’t get these.” I had only brought two hats and one of them I left at the hotel, so I explained to him that I wasn’t going to give it away. He wanted to trade but didn’t have a hat on him, so he told me to wait for him. 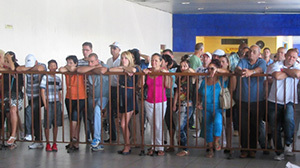 Cubans awaiting their loved ones at the Havana airport. As he ran off, and my group was walking out of my sight, I didn’t really know what to do. I told the tour guide about the encounter and she said with confidence, “he’ll be back.” So the tour guide stayed back with me; she said that she’ll take it as an opportunity to shop for a few minutes. And no more than three minutes later, he came back with a brand new sunhat. I felt like this was an opportunity of a lifetime; a man walking up to me in a foreign country with such a high interest in my cap that he’s willing to chase me down and offer a trade. Now we both have hats with great stories behind them, and there is a man in Cuba representing the Cougars! I can only imagine the compliments he’s received and how many times he’s told the story. I had many other great experiences, such as: going to watch Cuban boxing, a ferry ride to the island of Regla, bike-taxi rides with my best friends on the trip, eating at numerous Cuban restaurants, touring museums and art galleries, going to the beach, and shopping at various shops and a swap meet. There isn’t enough time to elaborate on those times, but I might blog about those experiences later when I’m reflecting more on the time I spent there. 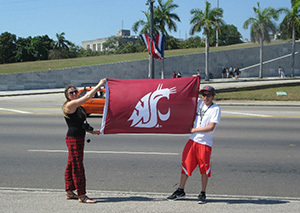 Frazier and a classmate wave the Coug flag in Havana! While in Havana, there were a couple of things that were constantly on my mind, and they likely changed my perspective on life. First, because of the socialist-communist government system, the citizens only make $25 a month. Just having knowledge of their wages made me conscious of how much my money/tips would help out the workers and their families. Second, I gained a greater understanding on how different governments operate. Especially in Cuba where there is a one-party political system, and the citizens and journalist don’t have the same rights of freedom of speech that we enjoy in the U.S., it made me appreciate the fact that I am American. 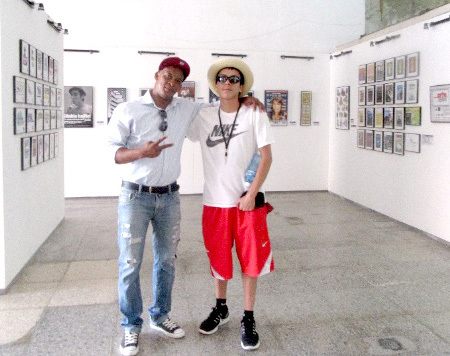 After 12 days, I was immersed in the Cuban culture. I didn’t want to leave on the last day. It was almost like a culture shock coming home. I felt like there was so much more for me to see, and more for me to learn. I made memories and friendships that will last a lifetime. Once relationships between Cuba and the U.S. are “normalized,” I’ll start planning my trip back there.